Most bookmakers ongoing promotions either give you a bonus bet or cash back if the promotion triggers. Crownbet often has promotions that when triggered give an equivalent amount in reward points. $100 in bonus bets is worth roughly $75. That’s because we look to typically retain 70%-80% of a bonus bets value in guaranteed profit when matching out a bonus bet by laying on Betfair. 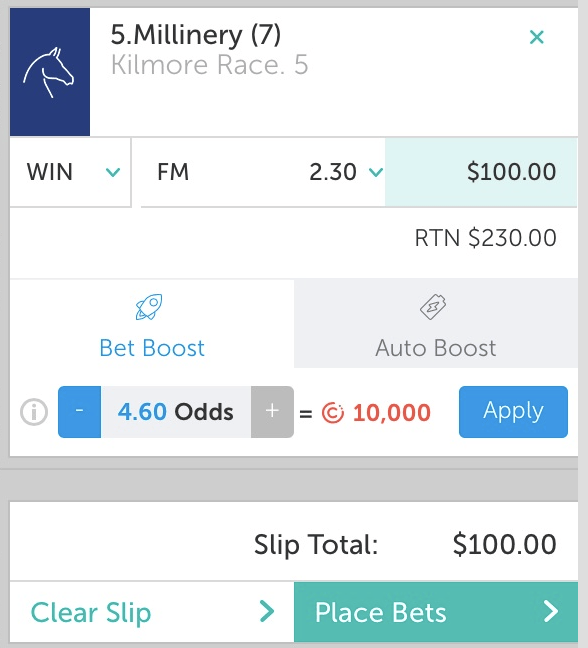 So if we found a horse to back at 7 at Crown that we could lay on Betfair at 7.4 then we could guarantee ourselves a return of $76.84 from our $100 free bet. If you visit Crown Casino in Melbourne or Perth and link your online account to a rewards card then you can convert your points to the equivalent value in chips (Max $500 a day). You can link your Crown Rewards membership to CrownBet via the ‘My Rewards’ page on the CrownBet website or by visiting a Crown Rewards desk at any Crown complex. At Crown Casino in Melbourne if you go to a Voucher Issuance Kiosk (VIK) you can get a printout that can be taken to any table where a dealer will take the printout and your card and swap for $100 in chips. You can then walk away and cash in those chips at the cashier. At Crown Casino Perth you can follow the same method but you will be given “complementary chips” which will need to be turned over to get chips that can be exchanged for cash. At the time of writing this article in Nov 2017 the boosts available are equivalent to converting the points to cash. Since it is much easier to get a close match on low odds horses it means you should easily be able to retain 90%+ of the value of the points. An example would be you have found a horse on Crown at 2.3 that can be layed on Befair for 2.32. Using your Crownbet boost you can take the odds to 4.6 for 10,000 points. To see your profit from the 10,000 points just stick the numbers in to the Matched Betting Calculator. It doesn’t matter what odds you select at Crownbet nor does it matter how much you boost the odds by it is always equivalent to gaining the reward points as cash. You can test this by playing around with any numbers and adding them to the calc. This method still relies on you finding close matches on races with a low commission on Betfair. But as you can use it on any race it should be easy enough to find short priced favourites with close odds to Betfair.